Shooting has been halted on a university's sports grounds where 57,000 pheasants were released to be shot in six years. The League Against Cruel Sports (LACS) called the practice at Gregynog Hall, Newtown, Powys, "shocking" and launched a campaign against it last year. A spokesman said its lease had not been renewed on the University of Wales-owned land while a review takes place. The Countryside Alliance said a decision should be based on evidence. A spokesman said shooting "delivers" on the sustainable management of natural resources, contributing to the rural economy, heritage, culture and the Welsh language. "Such an historic decision should not be a numbers game but should be based on scientific evidence and fact," he added. LACS started a campaign last November with spokesman Chris Luffingham saying it was a shame the university continued to "associate itself with birds being blasted out of the sky for fun". The organisation has now urged the university to "go the whole way" and stop the practice for good. "Universities should be forward-thinking, not dragged backwards by cruel traditions," Mr Luffingham added. Its Freedom of Information request revealed 57,000 pheasants had been released for shooting since 2013 while 160 native wild animals - including foxes and corvids - had been killed by gamekeepers to preserve the land for shooting parties. The group said the university's lease ran out on 28 February. LACS chief executive Andy Knott said: "Pheasant shooters might now be polishing their guns in the hope of returning to Gregynog Hall when the shooting season opens in October, encouraged only by the university's ambiguity on the future of 'hobby killing' on its land." 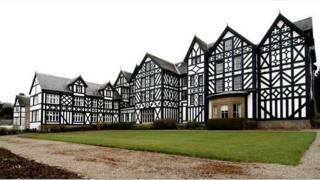 A University of Wales spokesman added: "No contracts/leases regarding shooting rights for Gregynog Hall have been renewed by the university as it is currently reviewing the structure and arrangements for Gregynog Hall."